Hi girls! Do you like googly eyes? I used to stick those on everything when I was in school! Now I made some nail art with them, check it out! I hand painted the mouths and teeth with a small brush. I do all my art work with polish, not acrylic paint, but it's harder to work with and causes some streaking every now and again. 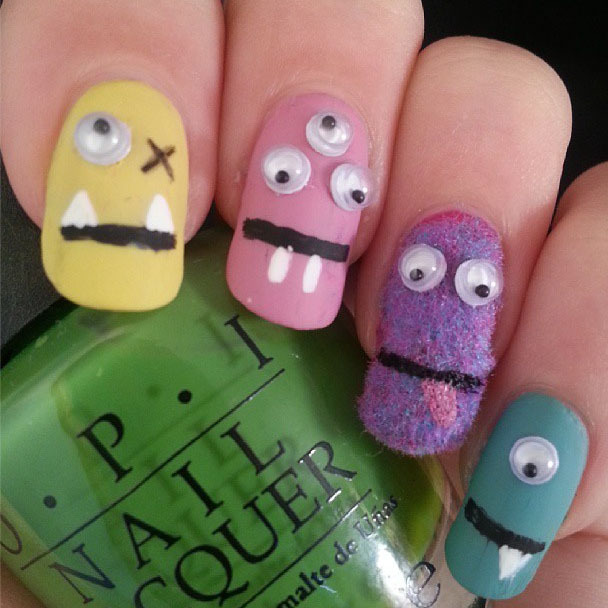 I also used some flocking powder on my accent nail to make the monster look all fuzzy. Isn't he a cutie? The fuzz came off quickly and there were only a few patches of purple left after a couple of hours. The eyes didn't have a topcoat over them, just a tiny dot of polish to glue them to the nail, but I must say they stayed on pretty well!